These specialists guide our work, create communities, and share good practice. Caption: Our capability leads from left to right including Meera Pankhania, Mariam Ibraheim, Gary Broadbent, Ruth Ellison, Vanessa Roarty and Libby Varcoe. Capability, noun, the power or ability to do something. Ninja, noun, a person who excels in a particular skill or activity. Today is World Ninja Day. While it may have been created by a burger company, ninjas mean more to us than speedy deliveries and the mysterious mask-wearing spies of Japanese culture. For us, ninjas are known for their skills, knowledge and perseverance. And their dedication to putting people first in the digital world. Specialising in service design, product management, content, interaction design and user research, our ninjas will help us help you. They connect, nurture, and champion our people as they work across different products at the DTA and further afield. They also guide our work, create communities and share good practice. The tools of their trade are: our content and service design groups; events including meetups, drop in clinics, sharebacks and conferences; and good old face time of the non-app kind. Last seen on GovInnovate’s panel about user-centred design on 11 October. Next appearing at our joint showcase with the Australian Public Service Commission for digital and HR specialists in government on the morning of Friday 15 December. Register to come along. Meera Pankhania, our service design ninja, helped deliver the most inclusive Olympic Games for London 2012 and comes with more than 12 years consulting in public and private sector including Barclays, Microsoft, United Nations (UNOG), Pricewaterhouse Coopers and the Department of Human Services (Medicare). Last seen advocating for the people who sometimes get left out of user research at the national accessibility conference OZeWAI on 20 November. Next appearing early 2018 (stay tuned for details). Meera also takes the lead on our service design community of practice with more than 600 members in government. If we don’t have a community of practice dedicated to your specialty, we’d suggest joining this one first up. Mariam Ibraheim is our product management ninja and keeps her hand in managing our dashboard products. She came to us from the ATO and helped set up our first joint transformation project with the Department of Immigration. Last seen being master of ceremonies at our six-weekly forum for digital leaders in government on 23 October. Next appearing at the first ever ProductTank meetup in Canberra with our international guest Jeff Patton and Allhomes head of product Dani Harmer on Tuesday 12 December. Register to join in. 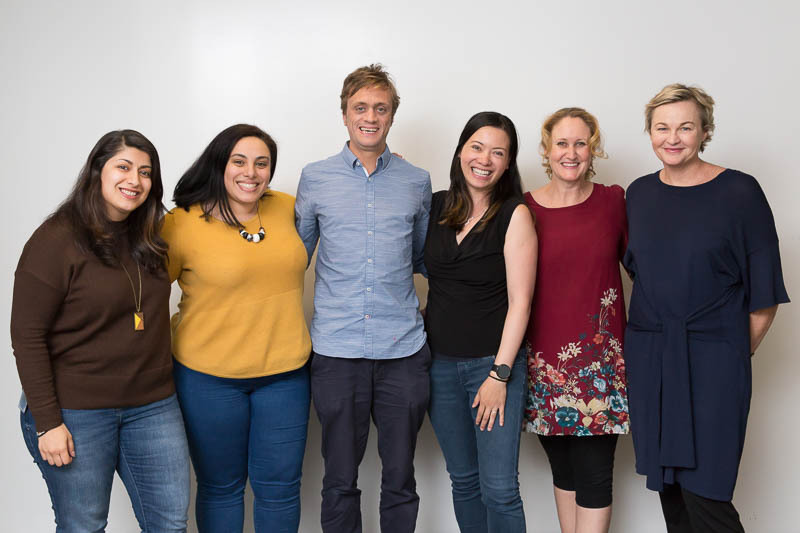 Libby Varcoe, our content ninja, ran a successful consultancy where she shared her ninja content skills with clients like Microsoft, Arts NSW, AMP, MBF, Westpac and QANTAS. Last seen at our content meet-up in Sydney on 16 November and you can listen to her October conversation with the Content Group on their InTransition podcast. Libby takes the lead on our content community of practice with more than 550 members across governments. This treasure trove of info is shared by content practitioners and open to anyone with a gov.au email address. Gary Broadbent, our interaction design ninja, has 16 years working in user-centred design, user experience, agile and collaborative processes. Gary used to be head of visual design at global agency Massive working with clients such as BBC, Telstra Media, Qantas, Emirates and Vodafone. Next appearing at our design meet-up in the new year. We’re working on a date so stay tuned to our social media channels. Ruth Ellison, our user research ninja, is a senior design researcher with 15 years public and private sector experience including Stamford Interactive, Pricewaterhouse Coopers, and the Departments of Immigration, Health, and Human Services. Last seen at our drop-in clinic for user research and service design people on 23 November. Next appearing at a DTA-hosted shareback by the Department of Industry, Innovation and Science who will talk us through their user research approach on Wednesday, 6 December. We keep sessions small for a more intimate conversation and this one is booked out but please let us know if you’re interested in showing your work to your peers in a future shareback (details below). You can follow the DTA on Twitter and LinkedIn to see what our capability ninjas are up to and get involved. Sign up to our blog to see us work in the open. Bookmark our Eventbrite to see new events as they are added. In the comments, let us know what topics you would like to explore at meetups. If your agency would like to do a shareback for government or there is a major event where you think our leads should speak, you can email capability-leads@digital.gov.au. Eleanor Ashton does the blog and social media channels for the DTA.